Software and cloud computing firm Citrix (CTXS) has definitely participated in the painful retreat in tech shares lately—it’s down a little more than 10% since July—but it’s also held its ground better than many, and in recent days a few revealing pieces of information have converged to paint a picture of a stock that some bullish traders may find compelling. Last week the stock broke out above a basing pattern it formed before and after hitting a multi-month low in late October (pulling back, coincidentally, to its late-April breakout level around $98.75). The stock has consolidated for the past few days, trading lower yesterday and tagging its most recent breakout level, a little above $105 (chart above). What do we make of such a high P/C ratio in a stock that has been on the rebound in the short-term, is not too far off its all-time high, and last released (positive) earnings on October 24, two days before the October swing low? People feeling bearish and hedging long positions, or bulls shorting puts in the expectation of a rebound? It’s never a cut-and-dried situation. A raw P/C ratio reading doesn’t tell you, for example, whether the put options volume was mostly traders getting into new positions or getting out of existing ones. If lots of traders were bailing out of existing long-put positions, for example, it could be considered a bullish signal rather than a sign of bearish sentiment. And even if the high put volume was mostly new long positions initiated because of expectations stock drop, traders often use high P/C ratios as contrarian signals: evidence of a bearish sentiment extreme—similar to a high Cboe Volatility Index (VIX) reading—that imply capitulation and the potential for a reversal. Although CTXS wasn’t making a new “panicky” low yesterday, tech stocks have certainly been getting hammered for several weeks, and investors, experiencing their second market correction of the year, couldn’t be blamed for getting nervous—and protective—every time the market dips. Markets form some of their most significant lows as fear is peaking. Of course, it’s impossible to know in real time when you’ve hit that peak. Finally, going back to the stock’s price action itself, some traders will notice that CTXS has consolidated just above the previous consolidation/breakout level—a setup some traders like to watch for future breakouts. 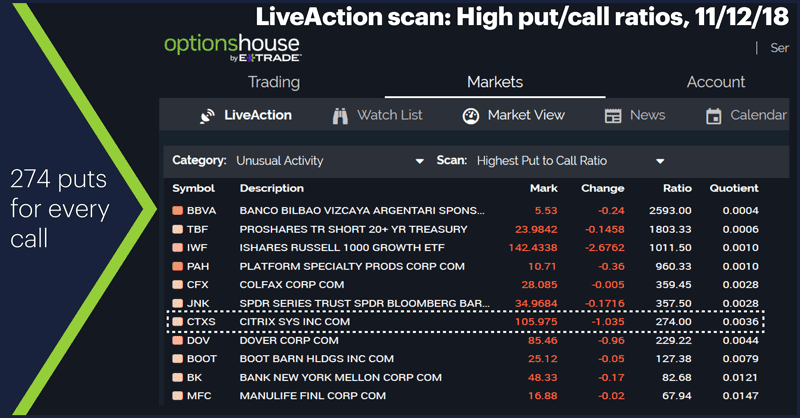 No stock can ever be expected to fight a market-wide trend without good reason, but if tech jitters subside, CTXS’s recent put options action and pullback may look more like an opportunity to bulls than a sign of further pain. Today’s earnings include: Advance Auto Parts (AAP), Aramark (ARMK), Home Depot (HD), Tyson Foods (TSN), Canopy Growth (CGC), Tilray (TLRY), Wix.com (WIX). 1 InsiderMonkey.com. 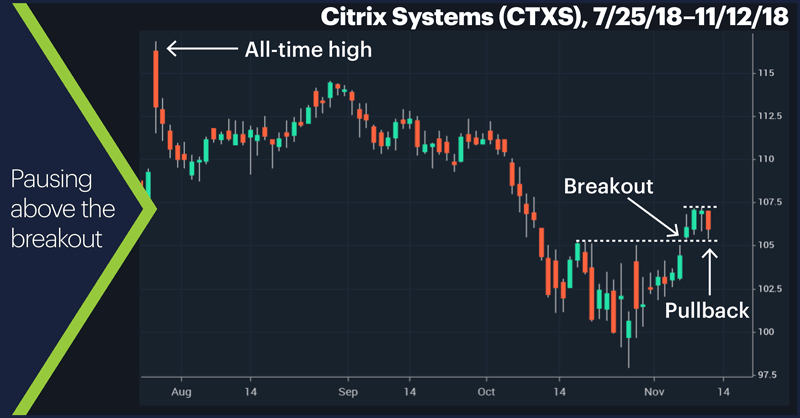 Paul Singer and Billionaires Don’t Think the Bull Run is Over for Citrix Systems, Inc. (CTXS) Just Yet. 11/8/18.